Video Games that focus on the daily grind of a police officers job, or any job for that matter, are few and far between. Instead, we focus on the bombastic, guns blazing aspect of their job that doesn’t exist. The issue is that the day to day life of a cop is boring and mundane like the day to day of just about every profession. It’s all well and good to maintain a sense of realism but it usually doesn’t make for compelling gameplay or an interesting story. Beat Cop from developer 11 Bit Studios manages to straddle the line between the mundane and the exciting in a way that feels organic, compelling, and fresh. The procedural cop shows of the 1980s are of a particular time and place. They have just the appropriate level of cheesiness and drama to create something beautiful. The characters I can think off the top of my head that defined the 80s procedural game were Magnum, Spenser, Sledge Hammer, Sonny and Ricardo, these guys were smooth and unnaturally charismatic. Their witty quips and their superb ability to maneuver a verbal joust like a battlefield defined a generation of TV, couple that with the fact that they were total badasses and you’ve got a recipe for pure entertainment right there. Or at least in the ways that you would think. There’s no hard-boiled detective work, no gun fights or street brawls. There’s parking tickets, petty theft, and domestic disturbances. The closest comparison I can make to Beat Cop is Papers, Please. 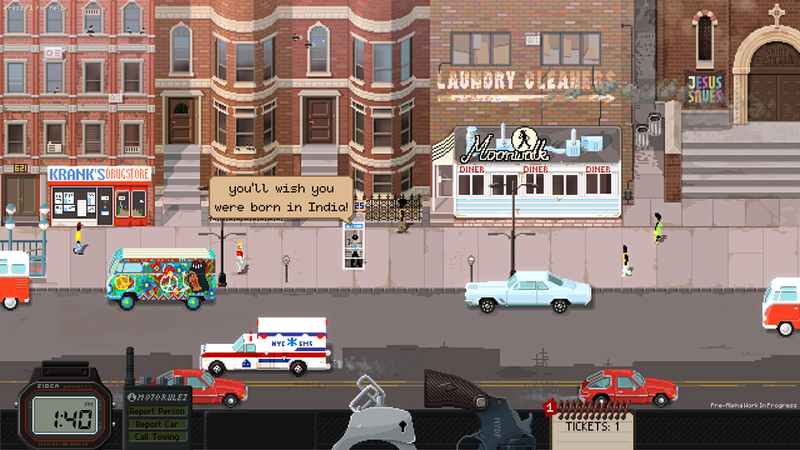 There is a substantial amount of influence from the 2013 border patrol simulator which may seem bizarre at first. It threw me for a loop since I didn’t know what to expect from this game and I was thoroughly impressed. There’s a surprising amount of depth and variability similar to Papers, Please that encourages subsequent playthroughs and alternate choices. In Beat Cop you play as Jack Kelly, a detective framed for murder and demoted to the lowly position of beat cop. The game offers you a wide array of opportunities for you to fiddle with your role as a police officer. Do you want to play it dirty? Accepting bribes and allowing criminal scum to walk away from altercations unscathed is a valid play style. While you may not be favored by the citizens it will definitely allow you to make some quick, easy money. At the end of each day you receive a score sheet that shows the amount of money made at the end of the day. In Papers, Please your success and survival directly correlated to the amount of money you made in order to buy food and shelter for you and your family. This mechanic is used to a similar effect in Beat Cop where you are forced to pay alimony to your ex-wife, it’s a trope that is used effectively to serve the light-hearted nature of the game. The crux of the gameplay relies on you catching shoplifters and waiting for the real cops to take them away, inspecting vehicles and parking meters in search of discrepancies, waiting for tow trucks, declining bribes, and uncovering the occasional murder. It’s a job simulator that commands the same attention to detail that Papers, Please asked of it’s players. I know that I’m comparing Beat Cop to Papers, Please quite often, but, I do genuinely believe that it is a valid comparison and that it was a significant source of inspiration for the people at 11 bit. Papers, Please is also an excellent study on player agency. How will the player react to situations when placed in a, generally, mundane and mind-numbing position. Do they defect from their original goal or do they march forward, receptive only to the orders at hand. It’s a fascinating question that Beat Cop attempts to grapple with on a more light-hearted level. The UI was particularly eye catching, purely on the staggering level of detail at play. You have an appropriate arsenal for which to conduct your daily duty, visually represented on your pseudo utility belt at the bottom of the screen. On the far left is your watch which shows the time at which your shift ends as well as a visual reminder for certain meeting times, next is your radio which is used to call tow trucks and back-up depending on the situation, the cuffs are used to catch no gooders and evil doers in the midst of heinous acts, the gun is self explanatory, and your notepad can be used to document various objectives opportunities. Overall, Beat Cop shows a lot of potential and could turn out to be one of the better indie games of the year. The style, humor, and gameplay all integrate to form a fun and cohesive gameplay experience. I’d definitely keep an eye out for this game as it nears closer to release. As of now, Beat Cop is set for a Q4 2016 release date. Be sure to take a look at the official Beat Cop website for additional details and content.